A handful of newspaper and magazine publishers were among the North American “Captains of Industry” profiled by a Canadian-produced radio series in the 1930s. The Old Time Radio Researchers group library includes MP3 files of more than 50 episodes telling the life stories of bankers, retailers, manufacturers and more. The publishers are in powerful company, among manufacturers, meat-packers, financiers, railroad barons, and real estate tycoons, Some were close to the publishing business — department store pioneers Field and Wannamaker were innovators in mass advertising, and a prominent entertainment entrepreneur also had experience in newspapers, P.T. Barnum. While not explicitly about his newspaper work, the program mentions his contributions to “mass entertainment” and publicity — including the use of scathing negative publicity as a weapon against business competitors. The publisher biographies are mostly positive, given the upbeat theme of the series. But triumphs over adversity are dramatized, including a fire that destroyed Curtis’s first newspaper. Similarly, you will not hear the negative nicknames inspired by Munsey’s mergers and closings of newspapers, which led him to be called the “Undertaker of Journalism” among other things. 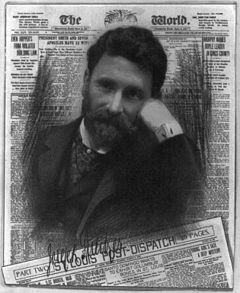 But the controversial aspect of his consolidation project is represented by a brief newspaper wake, portrayed at the merging of the New York Sun and Herald, and a well-played scene of his great disappointment when he ultimately had to sell the unprofitable New York Herald to Elisabeth Mills Reid, to be merged with her late husband’s New York Tribune. Alas, the Reid family and earlier founders and publishers of other 19th century New York papers, including the Sun, Herald and Tribune, are not featured in the series. Neither is William Randolph Hearst. A few of the Captains of Industry were not in the newspaper business, but their products and services contributed to journalism, or their names and perhaps some of their fortunes trickled down into the publishing industry. The retail magnate’s grandson Marshall Field III (1893–1956) bankrolled the innovative newspaper “PM” in New York and the Chicago Sun. See Time magazine, 1943. Long after the family name became established as a synonym for wealth in America, it became associated with newspapers in the 20th century, but that took four more generations and a transatlantic crossing to reach John Jacob Astor V (1st Baron Astor of Hever), who purchased The Times newspaper of London in 1922. Similarly, the McCormick in the collection is an ancestor of newspaper publishers. Cyrus established the family fortune manufacturing agricultural machinery. His great-nephews brought the family into the newspaper business by taking over the Chicago Tribune, previously owned by their mother’s father, Joseph Medill.